111 MLAs of the ruling All India Anna Dravida Munnetra Kazhagam (AIADMK) in Tamil Nadu on 5 September attended a legislators' meet convened by Chief Minister E. Palanisamy, amid calls for a floor test in the Assembly by the opposition parties. 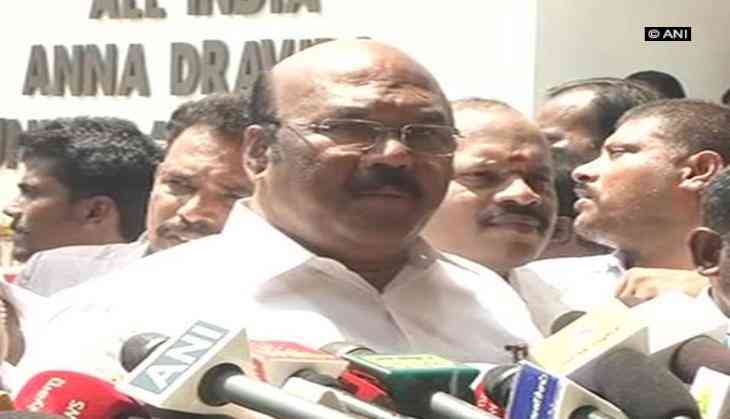 State Fisheries Minister D. Jayakumar on 5 September asserted the unified AIADMK is in majority, claiming that all its MLAs are extending support to Palanisamy. "111 MLAs attended the meet. One is not well, but has extended support, three from our alliance also support us. One of them is the speaker. Nine MLAs from other group were contacted on phone and they extended support, so we are in majority," Jayakumar told the reporters here. After its 21 legislators switched to rebel camp headed by "ousted" leader T.T.V. Dinakaran after withdrawing support to the chief minister, the unified AIADMK had convened a crucial meeting of the legislators. Though the AIADMK had also invited the rebel MLAs to the meeting, they denied the proposal. Governor Ch. Vidyasagar Rao is yet take a decision on the letter given by 19 rebel MLAs seeking to remove Palanisamy. The AIADMK has 134 MLAs in the 234-member state Assembly.